Explore the unique collection of Red Tiger Eye Tumbled Stone at Crystal Export. Its attention on the lower chakras is the thing that enables red Tiger Eye to send higher energies through the organs of the lower half of the body. Red Tiger Eye helps in upgrading certainty and confidence. It will give you inspiration and motivation in all aspects of your life. Tiger's eye is made primarily out of silicon dioxide and is hued basically by iron oxide. 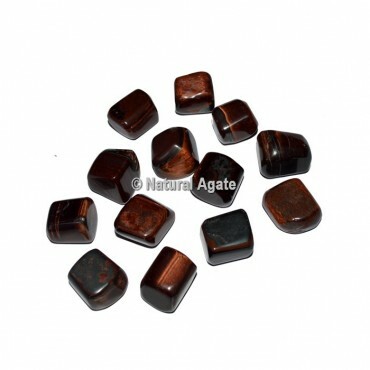 Red Tiger Eye Tumbled Stone will ensure your integrity. It will ensure that you won't be trapped in circumstances where you have to sacrifice your uprightness and the various qualities that you maintain. Order online at Natural Agate.